Who’s Knocking At Your Door? Is getting in a prospect’s front door the answer to driving quality sales volume or a sure way to get slammed? Lenny Gray was a Brigham Young University student in 1998 when he spent his first summer knocking on doors in hopes of earning enough commission to help pay for school. He was no stranger to the concept — many fellow students took jobs like this — but Gray admits he wasn’t sure the whole thing would work out. After he saw a friend make thousands one summer, he decided to give it a try. “For me, it was a matter of paying my way through college,” says Gray, who moved to Birmingham, Ala., for the stint. He was the top-selling rep in the country for the marketing firm serving Orkin that summer. “I’ve been hooked ever since on the opportunity,” he says. Gray went on in 2003 to start Minneapolis/St. Paul-based Rove Pest Control with partner McKay Bodily, who had quite a different experience working the doors as a student. “I was above average but not an all-star like Lenny,” Bodily relates of the summer of 2000, working for the marketing firm. “I didn’t know the first thing about how to sell an account — and this is something that’s very common with companies that look at reps as an expendable resource, where they throw them out there to see who sinks and who swims,” he says. Bodily switched gears and moved into management after the marketing company negotiated rights to open Orkin independent franchises. He spent a couple of weeks in training and moved on to run a branch, focusing on operations. Today, Gray — author of Door-to-Door Millionaire — and Bodily consult with pest control firms on how door-to-door (D2D) sales can actually work as part of an overall marketing mix. Their approach to D2D is quite different than companies that grow exponentially, then sell. One such example is Alterra, the $75 million company founded in 2012 by CEO David Royce, who sold to Terminix in November 2015. The growth of Provo, Utah-based Alterra Pest Control (No. 19 on PCT’s Top 100 list) was largely attributed to D2D sales and Internet marketing. Rove has taken a more integrated D2D approach. “Our philosophy at Rove from the beginning has been that D2D is not going to be our only proverbial arrow in the quiver for marketing, and that is somewhat different than companies out there that are heavily into door-to-door and don’t worry about the rest of the marketing mix,” Bodily says. D2D has proven a sales boon to some big pest control players, and a bust to others who have tried and failed at D2D for myriad reasons: evolving consumer attitudes, an untrained sales force, the sheer cost of running a robust D2D program, the stress of maintaining quality service promises when sales flood in, and below-average client retention (nearing 50 percent cancellation rates, depending on who you ask). “In my experience, there are door-to-door sales companies doing it the right way, and doing it the wrong way,” says Paul Giannamore, managing director, The Potomac Company. The two largest independent players in pest control D2D sales, Alterra Pest Control and EcoShield Pest Control, are Potomac clients. “Door knocking can be very effective, and the big boys are proving it out,” Giannamore says. GOOD, OLD KNOCKING. Door knocking is probably the oldest form of sales, going back to the friendly guy knocking at the door to sell Encyclopedia Britannica or a vacuum cleaner. In the early 1900s, General Foods, owner of Maxwell House, sent coffee salespeople to drop off samples at homes. They’d return a week later to make the sale. Those numbers look awfully promising to a pest control firm looking to drive sales production. But are they real? Do the customers last? “No one can deny the impact of door-to-door sales in the service industry, and in the last decade we have seen an enormous increase in that type of marketing where companies hire specialized groups, saturate the market area and promote reoccurring pest control programs,” says Rusty Markland, COO of PestNow and author of The World Hates a Salesman. Volume sales are attractive. In 2015, an estimated $200 to $250 million in annual pest control account value was added to U.S. companies through door knocking campaigns, according to Potomac Company research. The majority of these sales were realized through “summer sales companies” that focus on door-to-door activity. At Rove, D2D generates 50 percent of new sales. Billboards, radio advertising and Internet support door knocking. Gray says D2D actually closes “loose leads” from those other marketing avenues. So what place does D2D have in a pest control company’s market mix, if any? Can any business fire up a door knocking campaign? What sort of expectations should owners have from D2D efforts, and what about customer retention — keeping those promises made at the door? PCT magazine explores how D2D can work, or not, in a pest control firm by sharing experiences from owners who have dedicated time and money in this most traditional form of marketing. And, we answer some questions about why some D2D teams are successful, and where their stamina and skill for “closing at the door” comes from. WHO’S KNOCKING? There are different ways to start a D2D campaign: by using in-house salespeople you hire and train — locals you bring in to knock on doors; or by outsourcing “summer sales” to a marketing firm that specializes in it. Dennis Jenkins, president, ABC Home & Commercial Services in Lewisville, Texas, first tried a D2D campaign in summer 1992. A marketing firm that employed mostly Mormon students had reached out to the company, but Jenkins thought ABC could run its own campaign at a lower cost. Students who have completed an 18- to 24-month mission to spread the word of the Church of Jesus Christ of Latter-day Saints learn from experience how to knock on doors. They share, they listen, answer questions and often get rejected. Michael Bond, an alumna and assistant teaching professor of marketing at Brigham Young University (BYU), says missionary experience does position those students to handle the rigors of D2D sales. As a student, Bond worked in sales, but not knocking on doors. And at home, he’s no different than any busy American that values his time. Recently, when two gentlemen from Vivint Solar — knocking is common in the solar power industry — approached him while he was in his backyard, Bond was a little put off. “I said, ‘I don’t know if this is the right time,’ but they were nice guys and they were polite, and they asked some good questions upfront that overcame my hesitancy,” he says. That’s how skilled D2D salespeople get in the door. “You can have a one-on-one conversation about something that might be confusing or technical or unknown, and you can better create that relationship between the consumer and the company,” says Tamara Masters, Ph.D., an assistant professor at BYU’s Marriott School of Management. So in spite of living in the information age where we can find answers by asking Siri or Google, nothing quite replaces that personal interaction. “On the Internet, you hunt around,” Masters says. Smart D2D strategies include understanding pest pressures in the area and understanding what neighbors are dealing with. “Pests don’t respect property lines, so if a house is dealing with wasps three doors down, there’s a good chance the door you’re walking up to may have the problem,” says Rob Greer, COO, Rove Pest Control. A good experience involves asking questions at the door and listening. But Jenkins has seen in his Texas market how D2D can get a bad name. That generally happens when a company is focused on selling a service (closing) rather than delivering the service (follow-through). No one wants a competitor to have a face-to-face conversation with their customers at the door. But Jenkins says D2D salespeople focused on just signing up customers don’t retain those accounts. And those who leave ABC for a front-door sales pitch do come back. “Returning customers is our No. 3 lead source,” he says. is knocking and how they approach a sale makes all the difference in whether D2D is a sustainable sales effort or a mad dash to build route density. And, that “who” doesn’t need to be students with missionary experience for companies to find success. Greenix in Columbus, Ohio, started in 2011 and has grown to 5,000 customers in that market. “We get close to 75 percent of customers through door-to-door,” says Kelly Garvin, head of marketing and design. Greenix’s in-house team of “mobile marketeers” is trained to knock on doors and represent the brand. The pitch is based on education. The salespeople go on ride-alongs with technicians so they understand how properties are treated and products are used. “It’s a hard job and not everyone can do it — and not everyone wants to do it,” Garvin relates. But by taking a team approach and focusing on building morale, Greenix has managed to cultivate a D2D team without relying on a marketing company that specializes in this sales avenue. “We pride ourselves on being honest, and I think that’s what closes a sale,” Garvin says. WHAT ABOUT RETENTION? That’s the question discerning companies ask — and that all companies should inquire about — before launching any marketing strategy. If you can close a sale but lose the customers after a year, is the investment in D2D worth it? In other words, what’s the end goal of the company knocking at the door? Retention is naturally more important to pest control companies that want to build and sustain a customer base. “We are selling our name,” Jenkins points out, adding, “Our favorite customers are the ones who chose us. Jenkins is referring to firms that build customer volume to look good on paper as an asset rather than as developing genuine long-term business. So, what are retention rates typically for D2D sales? In the first 18 months, a summer sales business can lose up to 40 percent of its customers, according to Potomac Company research. That said, customers that stay on board have retention rates that mirror the rest of the customer base. “Summer sales customers have higher defection rates in the first 18 months, but after they are seasoned, they retain almost identically to non-door-to-door sourced customers,” Giannamore says. Specifically, the average customer life of a residential pest control customer is 5 to 6.7 years, which is about an 80- to 85-percent retention rate, according to the research. At Clark Pest Control in Lodi, Calif., Nicole Kirwan Keefe relates that the company ran a robust D2D sales campaign for more than a decade. It launched in the mid- to late-1990s until the company stopped in 2012. “We were heavily dependent on it for quite some time,” she says. During the program’s heyday, Clark had about 15 branches, and each had a summer sales team of 15 or more students. “We worked mostly out of Utah,” Clark says of recruiting at BYU and Utah State University. Clark had an internal liaison who focused on hiring and onboarding the summer sales team, and as the program grew the company hired a few of the super-stars to actually run it. “They got a big commission and housing — and housing (costs) in this area are no joke,” Keefe says. While the summer sales teams knocked on doors and closed customers, technicians scurried to serve those new clients. “If we are going to sustain our routes, we want our guys to look at those routes as their own little businesses,” Keefe says, relating that this mindset shift did not happen overnight. “We compensated technicians with better commissions and tried to give them better offers (to sell), and we put the focus back on them as being our ultimate resource,” she says. This message is what Gray and Bodily deliver to pest control companies that enlist in their D2D marketing consultancy. “Door-to-door drives traffic through other marketing channels, so if you put efforts into your website or SEO, or if you have magazines with your advertisements or billboards with your name on it, door-to-door interaction will make people more likely to respond to those other marketing efforts,” Greer adds of Rove’s program. Cancellation rates within the first year might be 6 to 7 percent for a new D2D campaign done through the Gray/Bodily program (focused on training reps). After a program is in place for a while, cancellation rates are closer to 4 percent, which is the case at Rove Pest Control. “If you just have a group of guys going out and knocking on doors, the fall-out can be as high as 25 to 30 percent,” Gray says. As The Potomac Group research indicated, retention rates after 24 months — once customers are “seasoned” — mirror the industry average of about 80 to 85 percent. GETTING IN THE DOOR. With today’s focus on content and information-driven marketing, where does a D2D sales program fit in at a pest control company? Can any business pull it off, and do you have to hire in a “summer sales” firm to make it work? For companies on the brink of $1 million, a D2D campaign could push them over the benchmark. “But are you financially stable? Do you have the capital to dedicate to the program? And, the effort will take time and attention — are you willing to put that into it to make sure that you get off on the right foot?” Greer says, asking questions that pest control operators should consider before diving into D2D. For new companies getting the word out, building route density like at Greenix, D2D done in-house has helped build the brand and developed a large customer base. But at other businesses like Clark, empowering technicians to manage the lifecycle of a customer — from sale through service — is working much better. Giannamore says the industry is “slowly warming up” to summer sales, and an indication of this is that acquirers are willing to do deals they would not have in the past. In 2015, The Potomac Company advised on more than $150 million in summer sales-based companies alone. But the reality is, only a small number of traditional pest control companies actually participate in summer sales/direct-to-consumer sales. “As far as I can tell, ‘clover-leafing’ is about as door-to-door as most pest control companies get,” Giannamore says. D2D proponents like Gray and Bodily think those traditional companies can get in the door. The question is, do they want to? The companies we talked to do not feel threatened by D2D efforts of competitors. Rather, to knock or not is a company preference. The author is a freelance writer based in Cleveland, Ohio, and a frequent editorial contributor to PCT magazine. While the U.S. is in the process of choosing our next President, there is plenty of work to be done in Congress. NPMA Legislative Day 2016, scheduled for March 13-15 in Washington, D.C., presents NPMA and its members with an important opportunity to be heard on issues that impact them before the next administration takes over. Against this background of change, and potential change, NPMA Legislative Day 2016 attendees will be visiting their congressional representatives to make the pest control industry’s collective voice heard on important issues, most notably the proposed Overtime Rule and Clean Water Act. OVERTIME RULE. NPMA has been encouraging congressional representatives to oppose new overtime regulations proposed by the DOL in summer 2015. The regulations are in response to a 2014 directive by President Obama to update overtime rules under the federal Fair Labor Standards Act (FLSA). FLSA guarantees overtime pay at a rate of one and one-half the employee’s regular rate of pay for hours worked in excess of 40 in a workweek. The current FLSA has a salary threshold of $23,660 annually ($455 per week), meaning ANY employee making less is eligible for overtime. Employees making more than the $23,660 annual threshold are eligible for overtime unless they fall under a specific industry exemption (teachers, doctors, lawyers) or the “white collar exemption.” These exemptions include executive, administrative, professional, outside sales and computer employees. The DOL proposed rule would raise the minimum threshold to approximately $50,440 annually ($970 per week) in 2016. This new proposed level is equal to the 40th percentile of weekly earnings for full-time salaried workers. The threshold will be indexed to maintain the salary threshold at the 40th percentile. The DOL estimated that approximately 4.6 million employees that are currently exempt based on the $23,660 threshold, will become eligible for overtime under the $50,440 threshold. The rule does not propose changes to the current exemptions, including the “white collar exemption,” and the duties test used to determine the “white collar exemptions.” The rule does invite comment on these exemptions specifically, which raises concerns that the exemptions could be changed in the final rule. In September 2015 the public comment period for the DOL proposed rule closed, despite requests to extend the comment period. NPMA opposes the proposed DOL Overtime Rule for a number of reasons, particularly unintended consequences it may have on the pest control industry’s labor force. Bray said it may cause PCOs to employ more part-time workers and fewer full-time employees. “We think that this rule will actually hurt those very same people that organized labor and some of the proponents of the regulation say it benefits,” he said. Bray said NPMA does not anticipate the expanded WOTUS definition to have a significant impact on those who do structural pest management; however, included in the final rule is language that would maintain the current status quo concerning the National Pollution Discharge Elimination System (NPDES). NPDES is a national permit program that regulates the point source discharge of pollutants and chemicals into waters of the U.S. EPA has delegated NPDES authority to the states; currently 46 of the 50 states regulate NPDES permits independent of EPA. NPMA’s position is that NPDES permits are unnecessary, redundant and a costly burden because pesticides are already reviewed and regulated under the Federal Insecticide, Fungicide, and Rodenticide Act (FIFRA). In August, the Sensible Environmental Protection Act (S. 1500) — legislation clarifying that federal law does not require the redundant and unfairly burdensome NPDES permit for already regulated pesticide applications — was introduced in the Senate Committee on Environment and Public Works. Although S. 1500 never made it to the Senate floor last year, in January it was attached as a rider to the Sportsmen’s Act (S.659). Bray said he expects the entire Sportsmen’s Act will come up for vote in the Senate in the next couple months, possibly during Legislative Day. For more information visit http://legislativeday.npmapestworld.org. Contact the author at bharbison@gie.net. If you perform fumigations, take note: Changes — stemming from a perfect storm of recent events — may significantly affect your business in coming years. A series of events, not directly related to each other, has put fumigants in the public and regulatory crosshairs. And while it’s too early to tell how, it’s likely that PMPs who perform structural, container, chamber, tarp and other fumigations will have to change their practices. “I think we’re in uncharted waters here,” said Jim Fredericks, vice president, technical and regulatory affairs, National Pest Management Association, of the “perfect storm” that’s come down on these products. “The endpoint, we can only assume, will be increased regulation,” he said at a meeting of NPMA’s fumigation committee in October. GETTING TO THIS POINT. Several events occurred to get the industry to this point, including the announcement in December 2013 that the California Department of Pesticide Regulation (DPR) would evaluate exposure risks and potential mitigation measures for sulfuryl fluoride to reduce these risks to workers, bystanders and occupants re-entering structures. Earlier, in September 2013, the U.S. Environmental Protection Agency began a registration review of structural and commodity fumigants like methyl bromide, metal phosphides and phosphine. (Its review of sulfuryl fluoride began in 2009.) All registered pesticides undergo registration review every 15 years to ensure they work without unreasonable adverse effects on human health or the environment, and this process may or may not result in label changes, use restrictions or additional mitigation measures. In March 2015, NPMA and the Association of Structural Pest Control Regulatory Officials (ASPCRO) hosted a workshop for EPA officials re-evaluating fumigants to help them better understand the products, types of fumigation activities and the planning and monitoring that goes into each event. Over three days at the Rollins Learning Center in Atlanta, PMPs demonstrated four live fumigations: a full-blown residential structural fumigation, a chamber fumigation targeting bed bugs in furniture, and container and tarp fumigations to treat commodities for stored product pests. They also walked attendees through tape-and-seal fumigation procedures. EPA attendees found the workshop “to be very helpful, especially considering the broad group of disciplines that are involved in the re-evaluation of fumigants,” wrote Cathy Milbourn, an EPA spokesperson, in an email. Ironically, it was at this workshop that EPA and industry officials learned of the poisoning of a Delaware family on vacation in the U.S. Virgin Islands from methyl bromide, used off label to fumigate an adjacent condo to treat wood-destroying beetles. The incident received national media attention. Three of four family members remain in serious condition; the Associated Press reported the family and Terminix are in settlement talks. The incident was caused by “a blatant misuse of the product,” said Travis Swope, president of Griffin Pest Management in Santa Ana, Calif., and an active member of Pest Control Operators of California. But being together with EPA when the news broke “afforded us the opportunity to explain that this was the exception, not the standard,” he said. Later in August, Canada’s Pest Management Regulatory Agency announced new risk mitigation requirements for metal phosphides and phosphine gas, primarily used to treat food commodities, storage facilities and transport vehicles, citing unacceptable risks to workers and bystanders. Most notable: A buffer zone of 50 to 500 meters around treated sites. Registrants were required to amend labels by Nov. 22 or lose registration on Dec. 31, but PMRA may modify the buffer zone requirements before approving the new labels. As such, PMPs and phosphine producers are submitting historical monitoring data for consideration. As currently proposed, the buffer zones would “stop fumigation in many places, especially grain processing and storage facilities across Canada,” as they’d require evacuating people from homes, closing streets and businesses, and policing and monitoring these areas for traces of phosphine, said Fredericks in a phone call. Bystander exposure is a potential risk that PMRA has identified, noted Fredericks. “It’s a risk that hasn’t borne itself out in the decades of use of these products. The incidents that occur are when people are exposed to these products in the fumigated structure,” he said. In February 2015, two children died and three were sickened when their parents used illegally imported phosphine pellets off label to rid their Fort McMurray, Alberta, apartment of bed bugs. MARCH 13 – California DPR starts evaluating the exposure risks of sulfuryl fluoride due to it being named a toxic air contaminant in 2006. SEPTEMBER 25 – EPA begins a scheduled registration review of fumigants. FEBRUARY 22 – Two children were killed and three sickened when their parents used illegally imported phosphine pellets off label to rid their Fort McMurray, Alberta, apartment of bed bugs. MARCH 24-26 – NPMA and ASPCRO host a fumigation workshop for EPA officials at the Rollins Training Center in Atlanta. MARCH 24 – News reports appear detailing a Delaware family’s poisoning by methyl bromide while on vacation in St. Johns, U.S. Virgin Islands. AUGUST 16 – A family in Palm City, Fla., is hospitalized after being cleared to re-enter a home that had been treated with sulfuryl fluoride to kill drywood termites. AUGUST 27 – The Canadian Pest Management Regulatory Agency announces the addition of buffer zones to metal phosphide and phosphine labels. OCTOBER 7 – EPA Office of Inspector General announces a preliminary evaluation into the adverse impacts caused by structural fumigants and the agency’s program regulating these products. OCTOBER 20 – NPMA fumigation committee meets at NPMA PestWorld. NOVEMBER 4 – NPMA meets with the director of the EPA Office of Inspector General (OIG) and additional staff from the Toxics, Chemical Management and Pollution Prevention Evaluations Group within OIG’s Office of Program Evaluation. DECEMBER 7-8 AND 9-10 – NPMA and ASPCRO host fumigation safety and compliance training for PMPs in Puerto Rico and the U.S. Virgin Islands. DECEMBER 31 – Original deadline for California DPR to complete evaluation of exposure risks for sulfuryl fluoride. DPR was granted an extension; its report is expected in early to mid-2016. EPA to announce its decision following its review of fumigants. In light of the U.S. exposures, the EPA Office of Inspector General (OIG) announced on Oct. 7 it would evaluate the extent and nature of adverse impacts caused by structural fumigants, and whether the execution of the agency’s regulatory program (e.g., training, funding, inspections, enforcement, etc.) led to these incidents. The OIG is “like an internal quality assurance program” for EPA, said Fredericks. According to OIG Spokesperson Jennifer Kaplan, the OIG program evaluation team is undertaking preliminary research, and then it will determine whether/how the review will proceed. Field work typically follows preliminary research. “It is too early to project when the review may be completed or what the next steps may be,” she said. NPMA met with OIG in November to provide industry perspective. HOW WILL IT PLAY OUT? It’s difficult to say if or how these events may influence the EPA’s registration review decision, which should be complete in 2020. The two poisoning incidents are under investigation by EPA. “As with other re-evaluations, EPA considers incidents as a line of evidence in our risk assessments and our risk management decisions,” wrote Milbourn. The agency already is discussing how to improve label clarity to ensure proper use by applicators, and is working to enhance stewardship plans and develop fumigation management plans, she said. Buffer zones, which have been in place for soil fumigants for several years, were included in new methyl bromide commodity use product labels that EPA accepted in September (the result of a previous re-evaluation), wrote Milbourn. The industry is concerned buffer zones might be applied to all fumigants. “Since all of these products are now in registration review, what we would hate to see is some kind of spillover in a way that EPA is thinking about mitigating risk,” said Fredericks. Swope foresees a version of the California Aeration Plan (CAP) eventually making its way onto labels. Required by California DPR, CAP is a more rigorous safety practice developed by the industry that aerates treated structures while tarps are in place so employees removing tarps aren’t exposed to fumigant more than 1 part per million. The process uses ducted fans and takes a minimum of 12 hours. While CAP is expensive to implement — requiring more equipment, training and time — and has required companies to change their business practices, “I can say without a shadow of a doubt the process we developed is superior to what the standard label requirement was previously,” said Whitmore, who played an active role in creating and revising the plan, an updated version of the state’s Tarpaulin Removal Aeration Plan implemented 20 years ago. Another action could be increased regulatory oversight, something California PMPs have encouraged for 20 years. They collect $8 on fumigation jobs in the four Southern California counties with the highest prevalence of drywood termites to fund additional inspections (about 4 percent vs. 1 percent of jobs each year). This ensures “the most egregious violations are addressed” and “brings us to the table with the regulators” to identify trends, address discrepancies and interpret regulations, Whitmore said. Following the poisoning incidents, some PMPs in Florida, Mississippi and the Caribbean said local regulators had upped their scrutiny on fumigations. In the Virgin Islands, EPA and Department of Planning and Natural Resources are increasing training and permitting requirements for restricted use pesticides, according to media reports. Other possibilities are use restrictions and even the removal of certain uses or sites. WHAT NOW? In the meantime the pest management industry is making itself available as a resource to EPA and other regulatory agencies. NPMA is developing a “concentrated, unified industry strategy” as the current situation “requires an extraordinary response by the industry,” said NPMA CEO Bob Rosenberg at the group’s October fumigation committee meeting. In January, the association held webinars to get member input on common-sense stewardship opportunities. This input will be developed into strategy during an industry stewardship summit held during Legislative Day in March, and eventually shared with regulators at a stakeholder meeting later in 2016. ASPCRO created a committee to follow EPA’s registration review of structural fumigants. Committee members represent seven states, five regions and the industry. “ASPCRO intends to continue its efforts to assist its member states, EPA and the industry to ensure a good understanding of structural fumigations,” wrote Liza Fleeson, ASPCRO’s president, in an email. Milbourn encouraged industry stakeholders to engage in EPA’s public participation process (http://1.usa.gov/1NkkxnV). “It is helpful to the Agency to keep an open line of communication with stakeholders throughout the entire re-evaluation process,” she wrote. Sulfuryl Fluoride – A colorless, odorless gas widely used in structural fumigations (with chloropicrin) to kill drywood termites and other wood-destroying and structural pests, as well as to fumigate various food commodities and structures, including mills and food-processing facilities. Phosphine – This gas is one of the oldest and most versatile fumigants in use for durable commodity applications, such as bulk grain bins, grain storage structures, bagged grain or seed, bulk stored flour, dried fruits, nuts and other food products, including those in transit in rail cars. It is commonly generated from aluminum and magnesium phosphide formulations. Methyl Bromide – For food and non-food applications (not residential structures), the fumigant is used for quarantine and pre-shipment treatments, treating perishable and durable commodities, soil, mills and food- processing facilities. Being phased out under the Montreal Protocol, it is formulated as a liquid with or without chloropicrin. Chloropicrin – A liquid fumigant primarily used in conjunction with another fumigant as a warning agent due to its olfactory detection by people and resulting irritation at very low concentrations. In early December, NPMA, ASPCRO and other partners hosted intensive training workshops in San Juan, Puerto Rico, and St. Croix, U.S. Virgin Islands (with a live video feed to St. Thomas) on fumigation safety and compliance. Registrants continue to conduct studies and gather information so regulators “have the science to evaluate risks,” says Janet Rowley, global business leader — pest management for Douglas Products, which makes fumigants for commodity and structural use and recently purchased the ProFume and Vikane gas fumigant (sulfuryl fluoride) business from Dow AgroSciences. The conclusions of EPA and DPR are “definitely a work in progress,” she said. Douglas Products has a long tradition of product stewardship, including annual classroom and field training programs that keeps applicators well-versed in regulatory nuances, Rowley said. This month the company will unveil a website designed to help consumers understand the process of structural fumigation. There’s a lot of confusion about what a fumigation is, and the website, which is based on consumer research, will provide information in a way consumers can understand, she said. Fleeson of ASPCRO reminded PMPs to read and follow the entire pesticide label and all labeling, such as application manuals, before applying fumigants, as well as to be aware of state laws and regulations (including certification or licensure requirements) that may differ from federal regulations. Methyl bromide labels have been amended and new label language will appear in 2016, and sulfuryl fluoride labels require the certified applicator and application personnel to complete the product stewardship training prior to use, she reminded. “Now is a good time to self-audit your operation to ensure compliance,” said Fleeson, who encouraged PMPs to contact their state lead agency with questions. Because of this, Rowley says she believes there’s a collective desire among regulators and industry to find workable solutions. She’s “very optimistic” the industry will be able to continue offering fumigation service. Modifications to labels are a possibility, “but I still think it will be very doable in the end,” she said. Email the author at anagro@gie.net. New Law Bans Lawn Pesticides in Montgomery County, Md. Here’s why PMPs should pay attention to this regulatory action. Last October, Montgomery County, Md., passed a law banning the cosmetic use of pesticides on private and county-owned lawns, playgrounds and the grounds of child-care facilities, becoming one of the few jurisdictions in the nation to have such restrictions. The law also prohibits the use of neonicotinoid insecticides on county-owned property. The ordinance takes effect on July 1, 2016, for county property and Jan. 1, 2018, for private property, and applies to the use of both professional and consumer products. While exemptions for certain use patterns exist — for instance, pesticides can be applied around or near foundations to control indoor pests — most lawn care professionals will be limited to using products approved by the U.S. Department of Agriculture’s National Organic Program or that are considered 25(b) minimum risk products by the U.S. Environmental Protection Agency. WHAT’S THE BIG DEAL? Pest management professionals who don’t offer lawn care may think the law doesn’t affect them, but this is a false assumption long term, said Karen Reardon, vice president of public affairs at Responsible Industry for a Sound Environment (RISE), the industry group that led efforts to oppose Bill 52-14. “We caution against the feel of a short-lived victory if you’re exempt because it’s just that: very short lived,” explained Reardon. “Once these types of laws are in place, activists don’t stop. They look for the next use pattern or the next active ingredient” to target. The focus on lawn pesticides, considered “easy, low-hanging fruit” by activists, is only the beginning, she said. And while some PMPs may view the law as being not-so-bad for business, these ordinances do heighten consumer misconceptions that properly applied, EPA-registered pesticides are harmful. “This type of legislation just feeds into that fear” despite the lack of scientific evidence and ultimately makes pest control more expensive, said Brian Schoonmaker, executive vice president and legislative chair of the Maryland State Pest Control Association and president of Capitol Pest in Bethesda. “All these laws do is pass on the added costs to the consumer at great cost to them and no benefit,” he said. “We know the activists are empowered right now and feel like they can’t be stopped,” said Mark Schlossberg, president of the Maryland Association of Green Industries and of Pro-Lawn-Plus in Baltimore. They know “they can’t get everything they want all at once so they do it in steps,” he said. “The divide-and-conquer strategy can be very successful for supporters of these prohibitions,” explained Reardon. The first bill to ban lawn pesticides was passed in Washington, D.C., in 2012. The spirit of that bill moved to the community of Takoma Park, Md., and was passed after three tries. Some members of the Montgomery County Council live in Takoma Park, “so the idea got legs and moved to the county level,” said Reardon. ALL FOR ONE. That’s why industry unity is so important — especially in Maryland, which has implied but not statutory pesticide preemption. Forty-one states have preemption laws that recognize the Federal Insecticide, Fungicide, and Rodenticide Act as the law of the land and make state regulatory agencies the rule-makers at the state level, preventing local governments from passing their own pesticide regulations on private property. Not having preemption “is a huge problem for our state. We’re always fighting these kinds of battles,” said Schoonmaker. In Montgomery County, RISE spent nearly two years organizing “the largest grassroots effort in our 25 years,” said Reardon. Lawn care, retail DIY, golf, agriculture, structural pest control and other industries worked together to oppose the bill. On any given day in 2015 up until the vote on Oct. 6, “we had 400 people actively engaged with us and most of them were asked to do something almost every day,” she said. As a result, amendments to the bill were added, such as an exemption for vector control. Without this, mosquito work in the county would have been prohibited. Still, if more pest management professionals had participated in the hearings, “maybe we could have defeated this thing,” said Schoonmaker. The biggest challenge, he said, is “getting our industry to care” and to show up to meetings with legislators and local officials. “Some of these bills that should never get passed will at some point get passed because we don’t have enough people standing up and saying anything about it,” he cautioned. And start building relationships with state legislators and local politicians “so they know who you are before a problem arises,” advised Schlossberg, who’s been active in state politics for 30 years. Lawn care professionals didn’t have relationships with Montgomery County council members before this issue came up, but the activists did, he said. “To show up at the local or county level and take the short view or be ready and willing to see another user category disadvantaged has long-term consequences,” Reardon added. The 2015-16 El Niño has been every bit as powerful as its record-setting 1997-98 predecessor, which brought storms, floods, landslides and unprecedented warmth to many areas of the country. What else did it bring? A glut of pests. Let’s start with the historical look. A spring 1998 article posted by CNNMoney reported that pest management companies were “enjoying a booming business — reporting as much as a 20-percent jump,” thanks to the earlier, wetter spring brought about by El Niño. Mosquitoes, termites, ticks and grasshoppers were among the pests reportedly proliferating as a result of the unprecedented weather event. Many entomologists agreed that the industry had not seen a comparable bug season in decades. Does 2016 hold the same promise? It could. The annual precipitation map above illustrates that the majority of the United States experienced a wetter-than-average year in 2015. Texas and Oklahoma set records for precipitation. Cities including St. Louis also posted a record wet year. Many others — Minneapolis, with two-and-a-half times its normal rainfall in November and December, for example — set seasonal records by getting absolutely drenched toward year-end. 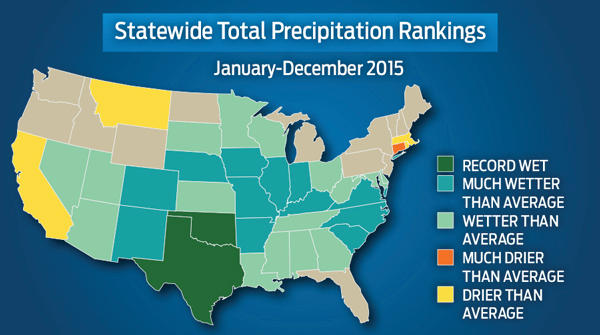 In fact, NOAA said that December 2015 was the wettest December on record in the contiguous United States. December was also the warmest U.S. December on record. Twenty-nine states, including every state east of the Mississippi River, set record-warm Decembers, and not one state experienced a cooler-than-average December. Even more notable is that every state in the Lower 48 was warmer than average in 2015, with some — Florida, Washington and Oregon — setting records for warmth (see temperature map). With the heat pushing winter back in a lot of regions, and the precipitation producing conditions (including standing water) conducive to pest propagation, we’re going to go out on a limb and say that you’re likely to see a whole lot of pest activity in spring and summer. Pending unforeseen weather anomalies yet to come, the conditions are right for a couple of very busy, and potentially prosperous, seasons. The author is a frequent editorial contributor to PCT. She can be reached at ddefranco@gie.net.